Add warm, vintage tone to any mic or instrument with the MicTube Solo preamplifier. Ideal for any recording or live setup, the MicTube Solo features an easy-to-use control layout and one of the most classic sounding, lowest-noise vacuum tubes: the legendary 12AX7. Aside from the tube, the MicTube Solo features a minimized circuit path, so it preserves the essence of the signal coming from the microphone faithfully. The MicTube raises the level of any mic up to line level, adding as much or as little of the tube's signature sound as you like. Two knobs and four buttons are all you need to optimize the MicTube Solo for virtually any setting. You'll find a -20 dB pad switch for mics with hotter outputs or louder sound sources. A phase reverse switch helps you optimize multi-mic setups, and the MicTube Solo also provides +48 volt phantom power for any condenser microphone, plus an 80Hz high-pass filter. In additional to a standard 3-pin XLR jack for microphones, the MicTube Solo also gives you a 1/4", high-impedance DI jack for in plugging guitars and basses. Separate Gain and Drive ("vintage") controls allow you to dial in the perfect blend of level and tone, and a vintage-style VU meter is perfect for keeping an eye on things. Professional XLR and 1/4" outputs complete the professional package. 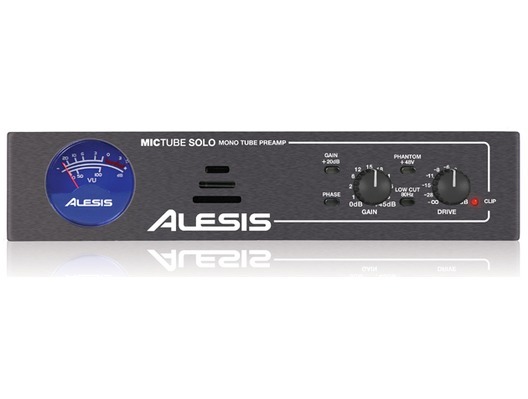 Here we have the Alesis MicTube Solo in manufacturer refurbished which will come boxed 'as new' with a 1-year warranty. Buy this amazing MicTube Solo with confidence with 100% satisfaction guaranteed or your money back!